eBay hosts up to 12 images per listing for free (you pay a fee on eBay Motors vehicle listings). The first photo (you can change the order once you have uploaded them) appears as your main Gallery photo in Search results and the featured photo on the listing page. Under the featured photo, there is a viewer where the buyer can scroll and click to enlarge your other images: The enlarged views magically appear in the larger photo area. Any listing on eBay is required to have at least one image to display the item. Photos must be a minimum of 500 pixels on the longest side. eBay recommends that they be at least 1600 pixels. You can choose from several image types: JPG (JPEG), PNG, TIF (TIFF), BMP or GIF. Most sellers use photos with the file extension. Do not get fancy. Images with borders, text, or graphics embedded in them are a violation of policy (plus they’re supposed to be pictures of your items, not ads). When you export your JPG images for eBay, and your software gives you a choice, select an image quality of 90 or more. Then eBay will optimize it for viewing on the site. When you prepare to list an item for sale, you will be asked whether to add photos. If you don’t want to upload from your computer — and have product images on your website — you have the option to have eBay copy your website images. Just input the URL of your picture in the tab entitled Copy Web Files (in the Classic uploader) or Import from Web in the enhanced photo uploader. To upload your image from your computer to eBay to be used with this listing, follow the directions onscreen. 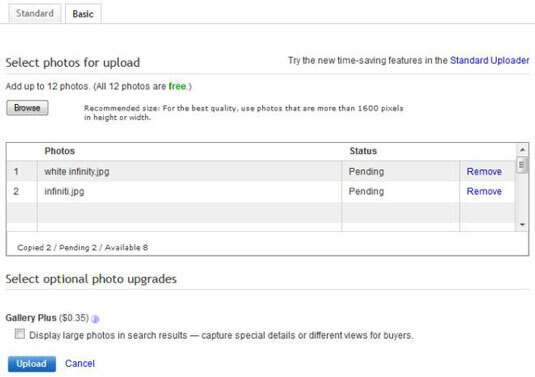 Click the Add/edit photos to use the enhanced photo uploader, or click the Classic Uploader link. After clicking the classic uploader link, click the Browse box. An Open File dialog box appears. Find your image on your computer and click Open. Add more pictures if you want and click Upload. eBay keeps an image online for the duration of your listing and for up to 90 days (as long as you have the link available to access the page). After that, the image disappears (unless you relist the item). You can always post the image again if you need it later; be sure to leave a copy of the image on your computer.